Guest post by Michael Lazar. Every December, consumers pad the pockets of online retailers worldwide as they shop for holiday gifts for their loved ones. For 2017, experts at the National Retail Federation and Internet Retailer have predicted that there will be double-digit growth from the same time last year, with at least a 19% increase in worldwide sales being forecasted. As the holiday shopping rush settles end of December, retailers cope with the litany of reverse logistics that follow. According to UPS, last year the shipping service delivered 1.3 million package returns to retailers in one day—with 5.8 million return shipments that followed during the same week—helping retailers recover an estimated $260 billion in lost sales. Expect this year to be no different. 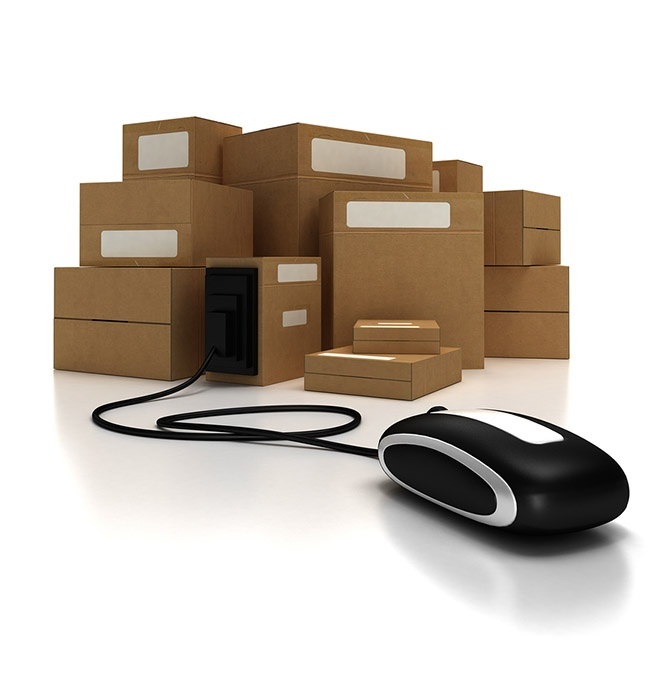 What can be different, however, is how an online retailer approaches their return policy. Long thought to be a thorn in the heel, new studies and data show that hassle-free returns generate more sales and improve long term loyalty and retention. What do consumers want from an ecommerce return policy, and why should retailers make it effortless for them? Here’s what the raw data says. Online shopping is an experience for consumers. It’s one that eliminates the hassles of local shopping and creates a convenient and seamless order-to-doorstep model that’s fueled the rampant growth of this industry in recent years. Consumers have embraced this convenience—helping Amazon Prime grow to more than 90 million subscribers over the past five years. With one-click checkouts becoming the norm, consumers can buy a product and schedule its delivery in just a couple of clicks. To pull off this feat, retailers have invested billions of dollars perfecting the online shopping experience. But when it comes time for a consumer to place a return, that’s where things can get tricky at many online stores. Overlooked is the “after buying” experience, explains an article in Entrepreneur magazine—something that needs to be just as easy as the purchasing experience or retailers risk lost customer loyalty and reduced retention. A look at the hard facts helps us better understand why consumers want hassle-free returns and how offering them benefits the bottom line for online retailers both in the short term and in the long term. New data has found that as much as 33% of products ordered online result in a return, according to a report that was published by the Wall Street Journal. While there are a variety of reasons for a consumer making a return—the majority of returns are generally the fault of the retailer, and not the shopper. Data for this can be traced back to the 2008, when Forrester conducted study for UPS that determined that as much as 65% of returns were caused by retailers, not consumers. 23% of the time it was due to the wrong item being sent to consumers by the retailer. 22% of the time, it was due to the product looking significantly different upon receipt by the consumer. 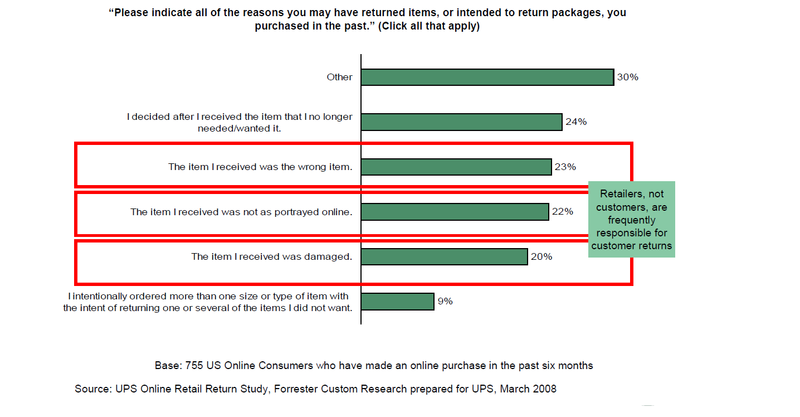 20% of the time, the consumer received a damaged product and issued a return or exchange. 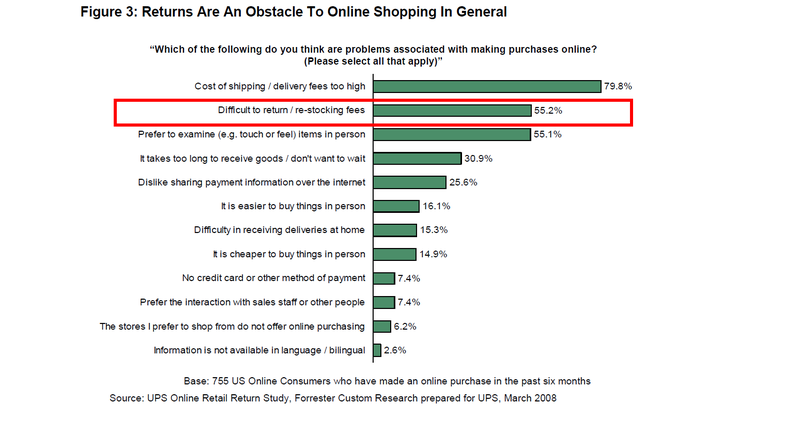 Combine this high return rate with some online retailers charging a restocking fee—typically 10% of the MSRP—and the fact that many retailers also charge return shipping fees, and it makes sense that the same Forrester report determined that 55% of consumers found it “difficult to return” products they ordered online. Naturally, it makes sense that consumers are wary of a retailer’s return policy. So much so, that most are inclined to read the return policy before placing an order online. Unlike shopping at a brick and mortar store—where returns are easy and fast—consumers are fickle when it comes to ordering online, due to the complexities that often accompany online product returns. This consumer wariness results in as much as 60% of consumers reading a return policy before making a buying decision, according to a ComScore study that was conducted for UPS. All told, the findings stipulate that a retailer’s return policy can make or break a sale—with 80% of consumers avoiding online stores that make returns a hassle. Does offering easy returns help improve sales for ecommerce retailers? The simple answer is: Yes. The article cites data from a Science Daily study that followed the sales and returns habits spanning 26,000 transactions from three online retailers over 49 months. For the study, one of the retailers updated their return policy to offer easy returns and free return shipping. “After a free-return shipping policy was instituted at one of the retailers, average spending per customer increased by $620 over two years. At the other, it went up $2,500. In concluding its report, the study determined that revenue could increase by staggering amounts when returns were made easy. Accounting for these metrics, the solution is simple: Make returns easy, and consumers will continue to buy from your online store. Fail to do so, and they’ll simply take their business somewhere else that does. Michael Lazar is the Executive Director of Marketing at ReadyCloud, an ecommerce CRM software solution that includes premium plugins like ReadyReturns, an automated online product returns solution for e-retailers. As a nationally syndicated author Lazar enjoys covering topics that are related to ecommerce returns.